Combining groundbreaking craftsmanship with scientific prowess, the TAG Heuer Carrera Calibre Heuer 02T Tourbillon Nanograph is one of Baselworld 2019’s most complex masterpiecesand certainly the latest avant garde innovation for the La Chaux de Fonds manufacture. 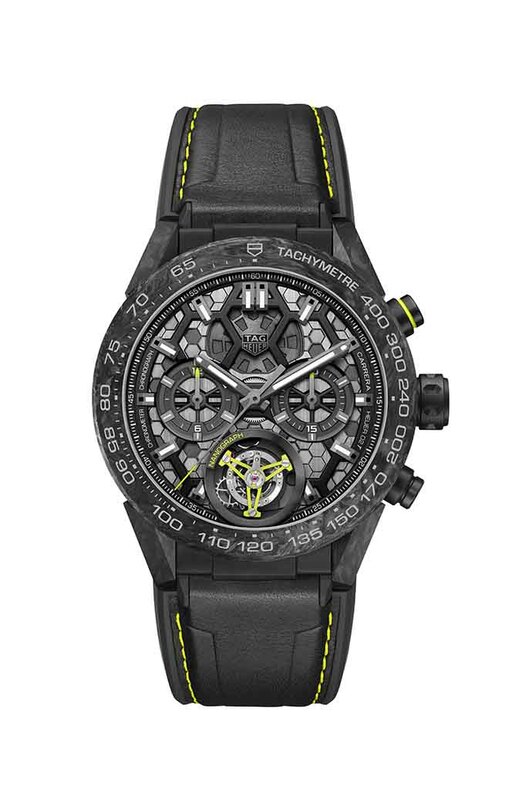 Unveiling a revolutionary new carbon composite hairspring, scientists at LVMH’s advanced research division conceived of this highly scientific innovation with the objective of providing TAG Heuer with one of the world’s most precise and perfectly concentric hairsprings for the Carrera Calibre Heuer 02T Tourbillon Nanograph. Assembled atom by atom, the carbon composite hairspring governs the oscillations of the balance wheel much like a traditional hairspring but its performance characteristics (both of the material and design) are anything but traditional. The advanced TAG Heuer innovation purportedly features (an interview with Guy Semon, Director of the Research Institute for the Watch Division of the LVMH Group, is forthcoming) outstanding shock-resistance (capable of withstanding 5,000G drop tests where metal hairsprings bent, silicon hairsprings broke, while the carbon-composite hairspring remained completely intact. ), anti-magnetic, and is thermally optimal and aeroelastic. Attached to a bright neon green(but really Superluminova coated) aluminum balance wheel with white gold inserts for inertia. The elegant geometry and perfectly concentric oscillations give the TAG Heuer Carrera Calibre Heuer 02T Tourbillon Nanograph much improved performance and unique countenance to the usually sombre yet exquisitely finishing regulating organ. 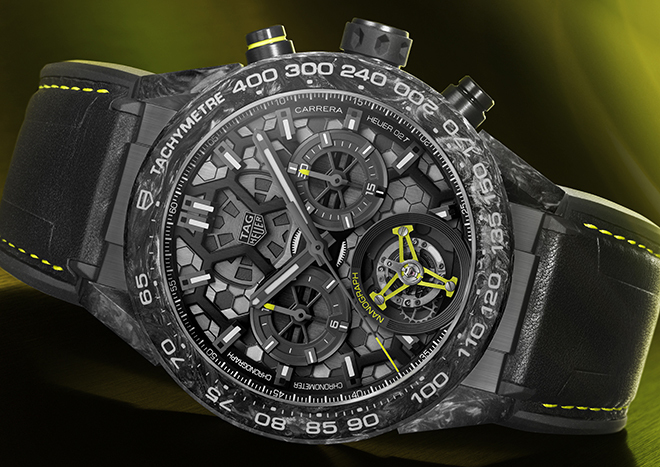 The COSC certified TAG Heuer Baselworld 2019 novelty takes inspiration from the molecular arrangement of the superior carbon composite hairspring – a lattice of hexagons grown in special reaction chamber rather than forged using conventional means. The elegant geometry and perfectly concentric oscillations give the TAG Heuer Carrera Calibre Heuer 02T Tourbillon Nanograph much improved performance and unique countenance to the usually sombre yet exquisitely finishing regulating organ. 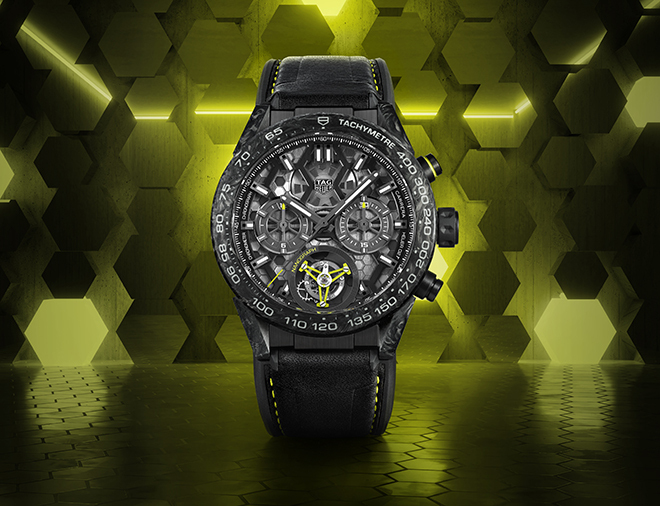 Aesthetically, the COSC certified TAG Heuer Baselworld 2019 novelty takes inspiration from the molecular arrangement of the superior carbon composite hairspring – a lattice of hexagons grown in special reaction chamber rather than forged using conventional means. 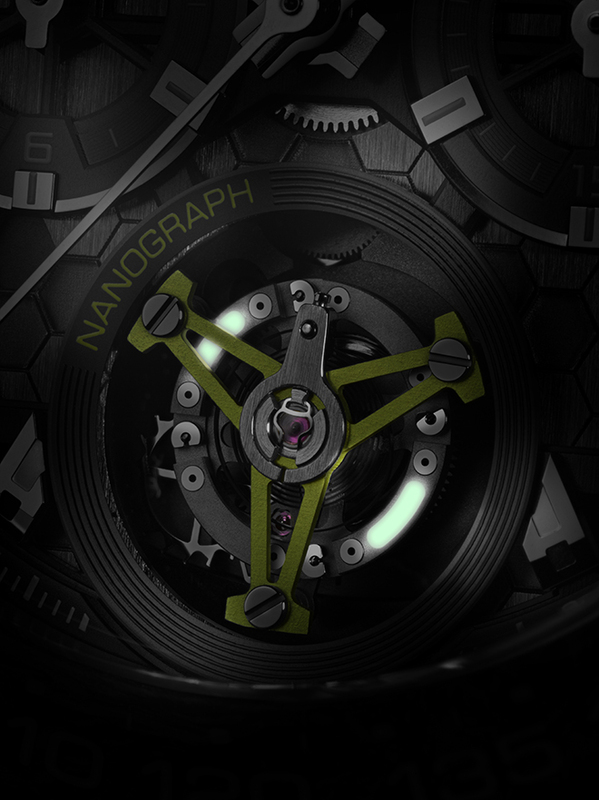 Hence hexagonal motifs abound the Carrera Calibre Heuer 02T Tourbillon Nanograph. The multilayered, open-worked dial makes visible the departure from another horological convention – perlage – instead the movement plate of the high performance chronometer-certified chronograph calibre features sandblasted and fine-brushed hexagons. 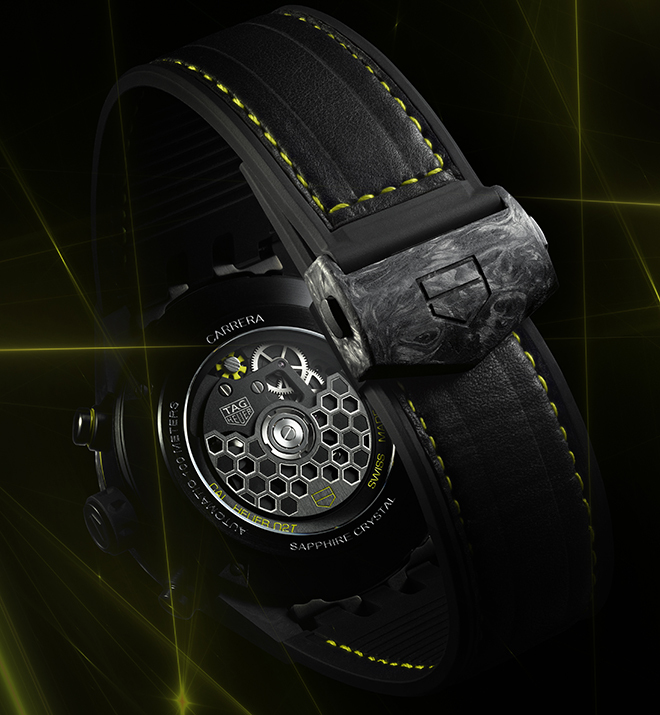 The pattern can also be seen on the oscillating mass, which has been treated with black PVD. 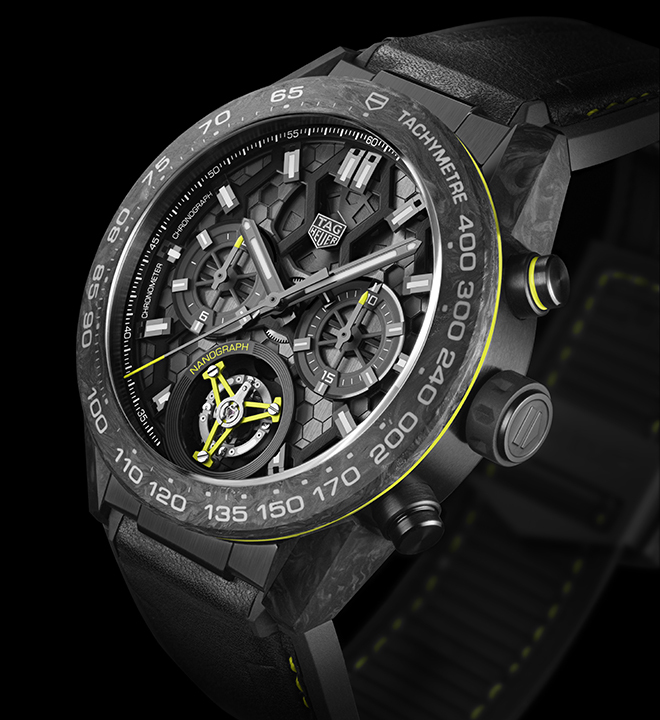 Not a limited production, the serially manufactured TAG Heuer Carrera Calibre Heuer 02T Tourbillon Nanograph chronometer is technically the first ever to use carbon-composite structure for hairsprings if you consider that Kari Voutilainen’s 2006 Master Chronograph never actually entered mass production and certainly not for the price tags offered here.